The Nature Trail Loop is misnomer as there are no interpretive plaques along it or a brochure for it. 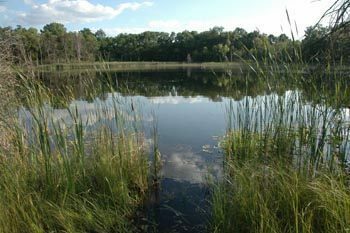 But the trail does provide campers at Sand Lake with a quick escape into the woods and is often used by walk-in anglers to reach Spring Lake with their belly boats for an afternoon of fishing. It’s connected to the Green Trail Loop by the Dickinson Trail and the two paths make for a natural route for hikers. Beginning and ending at the Dickinson Shelter the hike would be a 1.35 mile walk past three lakes, more than enough water to keep young children interested in the outing. Just the Nature Trail Loop itself from the campground is a hike of 0.7 miles and mountain bikers are not allowed on either. It’s a 100 yards from the Dickinson Shelter to post No. 10 marking the start of the Dickinson Trail. Head south (left) to skirt the 44-acre lake briefly. You no more depart Dickinson Lake than you come into view of Spring Lake and arrive at post No. 11 within 0.35 miles from the start. Head south (right). 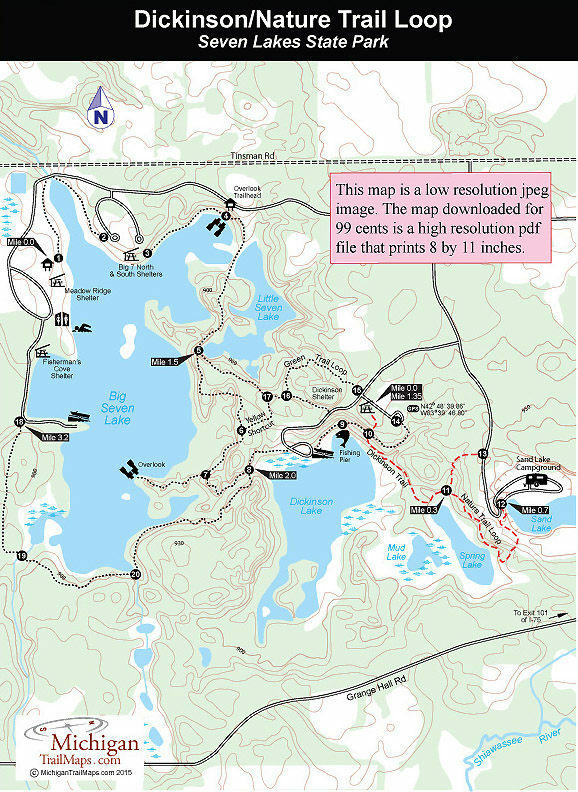 You’re now on Nature Trail Loop and for a quarter mile you skirt the scenic little lake than swing sharply east and climb a ridge to break out above Sand Lake and a view of the campground. Post No. 12, reached 0.7 miles from the shelter is on the edge of the campground, and from there you follow the park road north for almost a quarter mile. Post No. 13 leads you back on the trail and into the woods where you’re soon back at the post No. 11 and its bench. Backtrack the first segment of trail to return to your vehicle. Call the park at (248) 634-7271. For a campsite contact Michigan State Park Central Reservations(800-447-2757; www.midnrreservations.com).